2017 sees the 50th Anniversary of one of the most seminal cult series of all time - The Prisoner. Although The Anorak Zone already has a dedicated Prisoner Microsite, what better way to celebrate the anniversary than a rewatch of this classic? 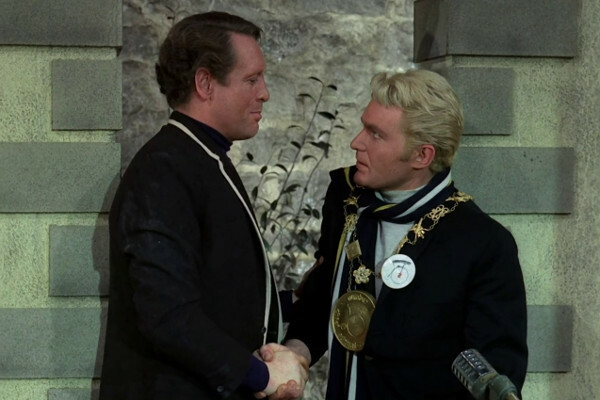 The Prisoner starred Patrick McGoohan as a man who had worked for the state, kidnapped and placed in a bizarre Village where his name was removed and he was given the identity "No.6". His every move was monitored and each week the person in charge - No.2 - would make repeated attempts to break his will and find out why he resigned. 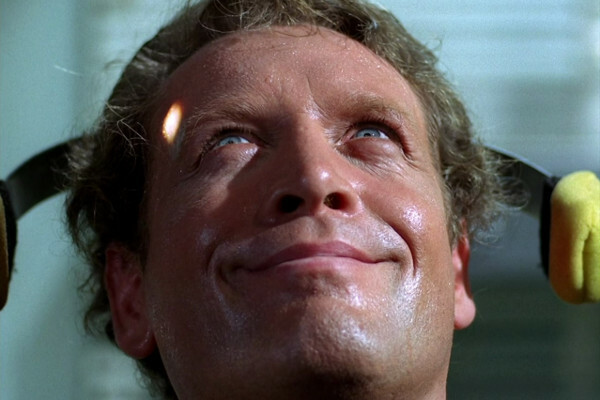 All, that is, except for this episode, where McGoohan was away filming the movie Ice Station Zebra, and the bulk of the story is taken up with Nigel Stock playing the lead role after a "mind transfer". While The Prisoner - a strange genre hybrid kind of show - touched on sci-fi/fantasy concepts like dream observing, ESP and resurrecting the dead, this might just be the most "out there" plot it ran. The premise is watchable for a lightweight spy drama, but the lack of care that went into making this one really harms it. 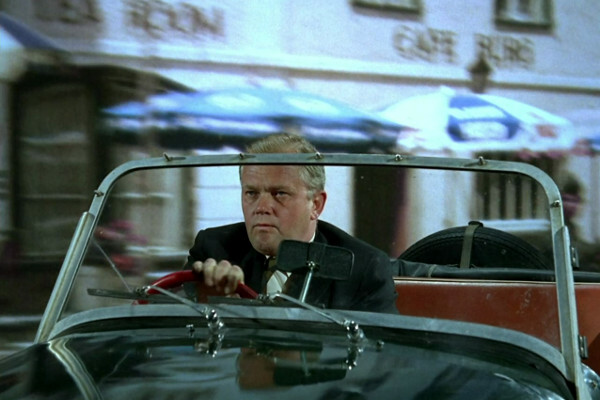 Continuity between shots, poor stunt doubles and a sequence where grey-haired Nigel Stock driving No.6's car is edited into shots of dark-haired McGoohan doing the same thing are just a small part of the poor production on show. The Prisoner is regarded as a well-made television series, shot on film and with high production values. Sadly, this doesn't always turn out to be the case, and by introducing The Village - an architectural landscape in Portmeirion, Wales - the series is forced to keep filming there, or risk corroding the illusion. While other episodes get round this by not featuring the exterior of the Village at all, save in archive footage, or use alternative, backlot locations to create the illusion of the place, altogether eight episodes use studio-based "mock ups" of the Village. This isn't always a bad thing, providing the episode has the invention to get around it, and while episodes like The Chimes of Big Ben have sections that need to be viewed with a kind eye, generally it's fine, usually amounting to just one or two brief scenes. Sadly, however, the two weakest episodes for this are It's Your Funeral and the entry here, which draw attention to such limitations, rather than distracting the viewer's eye away from them. This episode did have some footage shot in Portmerion during March 1967, but it was second unit footage with doubles, causing No.2 John Sharp to have about fifty different hair colours when seen from a distance. Clumsily edited, it features a shot of Village guardian Rover so brief that it's often not clear that "he" was in the episode, and it's not altogether clear what's going on. Hammer Into Anvil is traditionally a very popular episode among fans of the series; indeed, at date of writing it's the highest-rated on the Internet Movie Database, its 8.8/10 rating just slightly ahead of four episodes scoring 8.7. Yet here at the Anorak Zone it's never been that well received. Partly it's how basic and almost childish the plot is... No.6 makes a psychologically weak (albeit sadistic) No.2 break by making him paranoid. This generally involves lots of parlour tricks, like speaking to strangers and pretending they're involved in a covert plot with him, or playing several copies of the same record. If Hammer Into Anvil is a cat and mouse game, then it's strictly Tom and Jerry. Patrick Cargill's intense No.2 is regarded as one of the greats, but there's too much contrivance and forced humour behind the part. No.6 notes his weakness when he takes a demanding call (from, presumably, No.1) and responds with a meek and intimidated nature, repeating the words that the unheard caller is asking him. ("Assistance? Oh no sir, I can manage.") There's really no need for him to repeat the subtle threats he's receiving on the line, and he could have asked No.6 to leave the room before taking the conveniently timed call... but without this, there'd be no real starting point for the plot. By the time the episode has reached a scene with No.2 stamping his heels and nearly falling over when leaving a room in anger, the role has become less Marquis De Sade and more Norman Wisdom in Trouble In Store. Writer Roger Woddis, in his only Prisoner entry, was more of a poet and stage writer than a television screenwriter, and does bring some literary quality to events. Sadly, though, the execution of this one veers it towards farce, and undermines the real dramatic impact of a usually quite straight-faced programme. 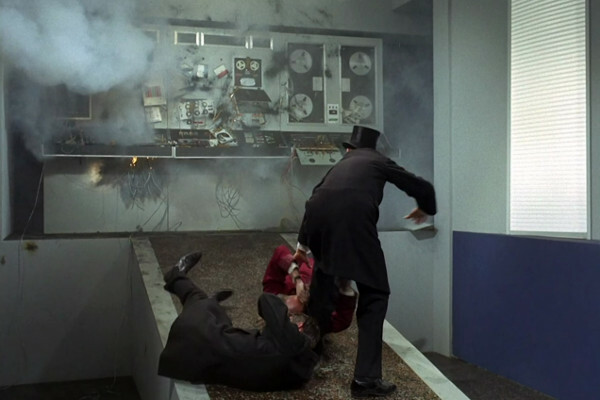 The General features The Prisoner's silliest ending, a ludicrous sign-off with No.6 blowing up a computer by asking it the question "why?" It's a shame, because the rest of the episode, involving mind control in education, has its moments. Like the main computer in Doomwatch, the computer here - codenamed "The General" - became outmoded by Chockablock. It was the 60s, of course, but a lot of the series has technology that wasn't around at the time, including the hand-held mobile phones placed around the Village, which wouldn't exist in reality until six years later. Although the technology had been in development for some years, it hadn't been completed at the time, and McGoohan's double take the first moment he picks up one of the cordless phones in Arrival is a little lost on audiences where the futuristic technology is now very much in the past, albeit retaining a sense of style. No official budget was ever released for the series, but by all accounts the entire 17 episode run cost around £850,000. As McGoohan was the highest paid star on television during Danger Man, it's not enough to calculate the inflation and assume that this would, by today's standards, reach around £15 million. While the figure would likely be much higher than that today, The General clearly shows cost saving, with some mock ups of the Village (notably the beach scenes) and some sets doubling for "exteriors". 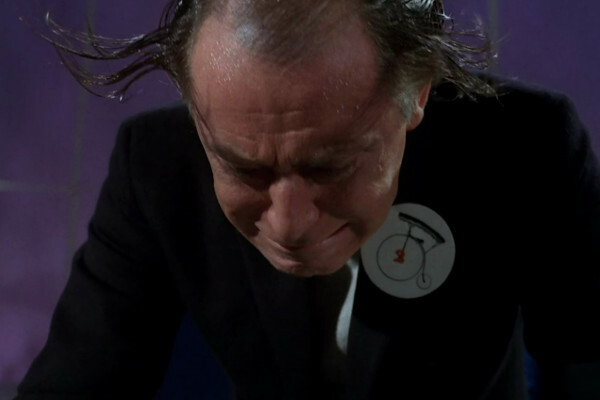 The Blu-Ray release of The Prisoner amends some of the slight issues with the DVD, such as Colin Gordon's voice partially appearing on the introductions to episodes in which he doesn't feature. However, on some episodes there does appear to be a slight "flanging" effect with the audio, particularly in scenes involving bands or crowds. It's not excessive, and shouldn't be a deterrent from buying a great set, but is noticeable in small sections of Free For All, The Chimes of Big Ben, A. B. and C. and the carnival scenes in this episode. The most charming episode on this first page of rankings, It's Your Funeral does once again suffer from being heavily "mocked up" in the studio, with over 7 minutes of footage taking place on sets as "exterior" shots of Portmerion. As with A Change Of Mind, second unit footage was shot in the North Wales location, but with doubles of McGoohan and guest star Annette Andre. Such substitutions fail to convince, and while 7 minutes might seem a paltry amount in this, the shortest episode, it's made far worse by so many of the scenes in question being pivotal, including a fight scene between McGoohan and guest star Mark Eden, which never convinces as being "outdoors". Patrick McGoohan had a reputation as a fierce perfectionist, with a huge number of his co-workers accusing him of everything from egomania to undergoing a nervous breakdown. For It's Your Funeral he brought a friend, Robert Asher, on board to direct, with the intention of having him direct further episodes. Asher had worked as Assistant Director on the films High Tide at Noon (1957) and The Gypsy and the Gentleman (1958), both of which featured McGoohan in roles. Unfortunately their working relationship broke down, with McGoohan publicly lambasting the director, then firing him and taking over the shoot himself. This wouldn't be the last time that Patrick would fire a director and take over the role, as the next episode in production, A Change Of Mind, suffered the same fate. Don Chaffey, director of four of the first five episodes to be filmed, also had a fractious relationship with the star, and three of the four Chaffey episodes had sequences directed by Patrick, with a fourth, Dance Of The Dead, seeing McGoohan advising on direction. The actual plot itself, is, rather like A Change Of Mind, something of a "non-plot": The Village wants to execute a retiring No.2 (Andre Van Gyseghem), so disguise their intentions by getting No.6 to warn him of the upcoming assassination attempt, in order to get Gyseghem to doubt him. The convoluted, semi-credible tale also contains "Kosho", a bizarre "sport" involving trampolines, crash helmets and a pool. Guest star Derren Nesbitt brings fun to his role of the new No.2, despite 50% of his performance being based around his glasses. Nesbitt admitted he didn't understand the script, and, not getting no reassurance from Patrick as to what it was about, played his No.2 as a bewildered man who was in a state of permanent confusion.